Clayborn Temple is a significant building which was an important location for the Civil Rights movement in Memphis. Dr. Martin Luther King Jr. spoke here and it was frequently the start and end point for Civil Rights marches and demonstrations. 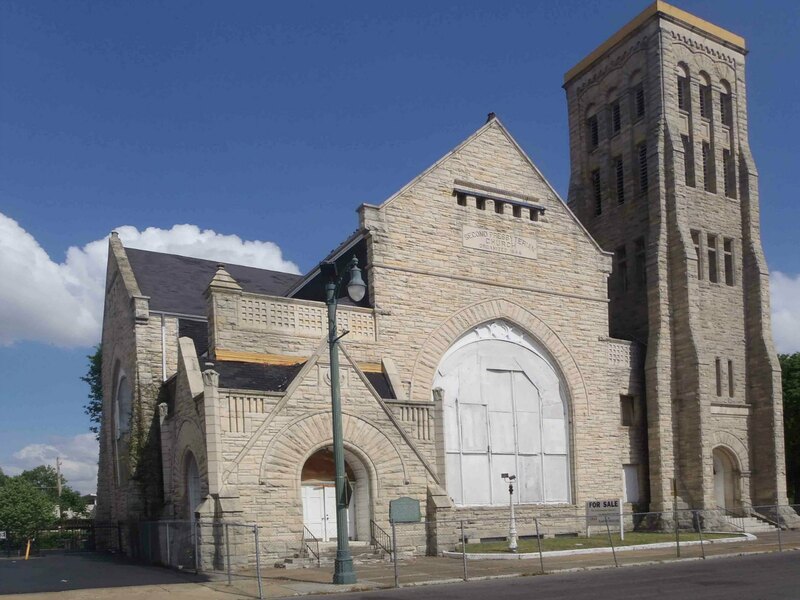 Clayborn Temple is located in a small park on of Hernando Street and Pontatoc Avenue, a few blocks south of Beale Street and the FedEx Forum. This marker on Clayborn Temple was placed by the Shelby County Historical Commission. There is no Tennessee Historical Commission marker at this site. Shelby County Historical Commission sign on Clayborn Temple, Memphis, Tennessee. Unfortunately, Clayborn Temple is currently boarded up and disused, although plans for its restoration have been announced. Civil Rights activities associated with Clayborn Temple include marches supporting the Memphis sanitation workers’ strike in 1968. These marches began from, and ended at, Clayborn Temple. The union ratification vote settling the strike in April 1968, a few weeks after Dr. King’s death, was also held at Clayborn Temple. The building’s designers, Long & Kees, were an architectural firm based in Minneapolis, Minnesota, named for its leading partners: Franklin B. Long (1842-1912) and Frederick Kees (1852-1927). Among other surviving Long & Kees buildings are the Minneapolis City Hall, Minneapolis Masonic Temple, . Although Clayborn Temple is an historically significant building, it is currently boarded up and is not being used (see photos above). Local residents we spoke with told us it has been boarded up for at least twenty years. When we last visited, there was a “For Sale” sign in front of the building. The Clayborn Temple building has apparently been on the market for several years. 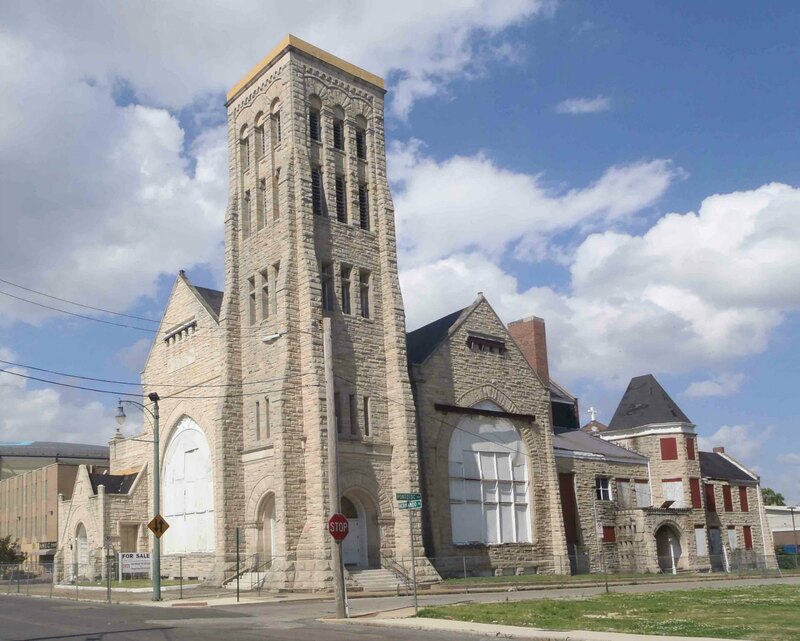 Plans for restoring Clayborn Temple have been announced. 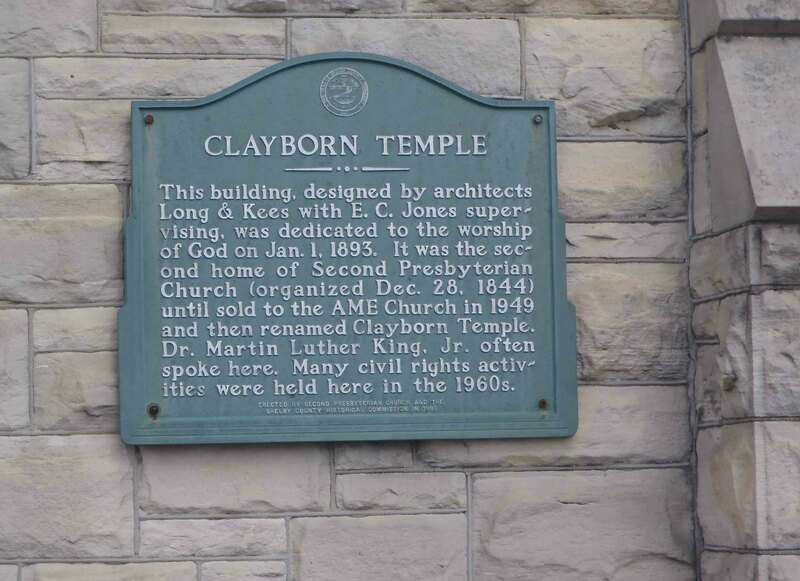 Apart from its connections to Dr. Martin Luther King and the Civil Rights movement, Clayborn Temple has connections to musicians included elsewhere on this site. The connections we currently know about are the funerals of Johnny Ace and members of the Bar-Kays (Carl Cunningham, Matthew Kelly and Jimmy King) being held at Clayborn Temple in 1955 and 1967 respectively. Here is a YouTube video uploaded by a group called Roaming Rednek Explorations, which goes into abandoned or derelict buildings and shoots video of the interiors. Clayborn Temple is private property, so while we do not condone or support entering private property unlawfully, this Roaming Rednek Explorations video shows the current appearance of the Clayborn Temple interior.